I'm trying to open my home folder on my raspbian lite sd card. 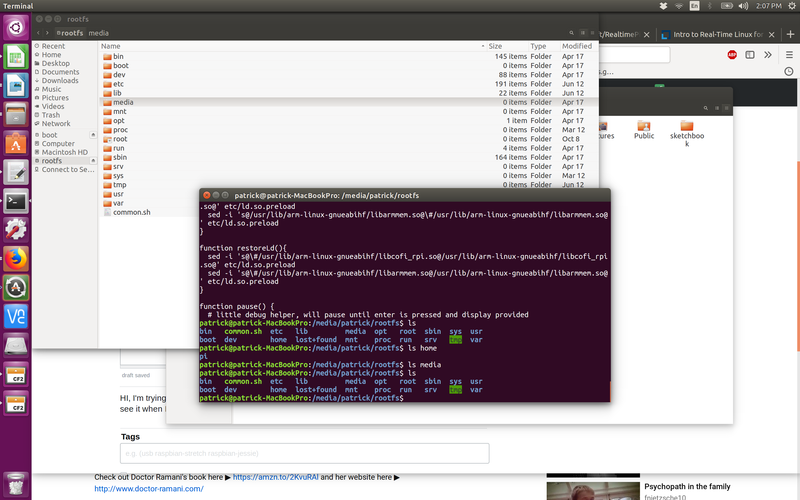 I have the rasbian os plugged into a sd card reader to my ubuntu laptop. I can't see it in drive but I can see it when I type ls. Anyone know what is the meaning of this? Once you have SSHed into your ubuntu Linux computer as root, open up a shell terminal and run dmesg to print out the kernel ring buffer. Please notice the last few lines. Then, plug your rasbian os into an SD card reader on your ubuntu Linux computer and again run dmesg to print out the kernel ring buffer. Do you see any new entries in the last few lines to indicate the recognition of your SD card as an sdX: sdX1 sdX2 (where X is the drive ID) partitions? If so, make a note of it. Then, run df on the same shell terminal to see if any of the sdX# partitions has been mounted. If not, then you will need to manually mount the partitions, i.e. mount /dev/sdX1 /mnt, etc. before you will be able to see the /dev/sdX1 partition mounted under /mnt. Once you are done, before you manually unmount the mounted partition, i.e. umount /dev/sdX1, etc. before you can pull out the raspbian OS from the SD card reader. One possible explanation is that you have a file called .hidden in your root directory, which Nautilus interprets as a list of files and directories which should not be shown to the user. You would be able to see the .hidden file itself in CLI if you run ls -a instead of just ls. Not the answer you're looking for? Browse other questions tagged linux raspbian-lite or ask your own question.